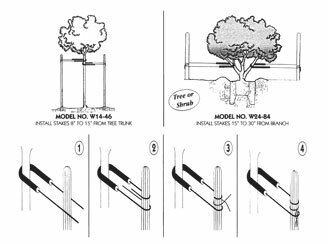 DESCRIPTION: MODEL 1446/2484; 14/24 COLLAR LENGTH 46'/84' OVERALL LENGTH COMPRESSION SPRING LOADED TREE TIE THAT WILL INSURE THE SAFE AND SUCCESSFUL DEVELOPMENT OF THE NEWLY TRANSPLANTED TREE. APPLICATION: NEWLY TRANSPLANTED CONTAINERIZED TREES THAT ARE UNABLE TO STAND ALONE OR NEED PROTECTION FROM THE WIND. DOUBLE STAKE WITH 2 TIES PER TREE. (SIZES 5-15 GAL./15-24" BOX) MULTI STANDERDS AND EVERGREEN. CONSTRUCTION: THE SOFT POLY VINYL 1/2" 0. D. / SOFT POLYVINYL METAL COLLAR IS WEATHER PROOF AND RESILIENT. WHEN LEFT UNATTENDED THE 3 PIECE CONSTRUCTION OF THE TREE TIE WILL EVENTUALLY BE PUSHED APART AS THE TREE INCREASES IN SIZE AND THEREFORE SELF-RELEASE WITHOUT SCARING THE BARK. FEATURES: NON-GIRDLING-SELF-ADJUSTING-NO PERIODIC INSPECTIONS-REUS-ABLE-SELF-RELEASING-INSURES NATURAL STRAIGHT UPRIGHT GROWTH-ALLOWS THE TREE TO MOVE WITH THE WIND-MAYBE REMOVED SOONER THAN ALL OTHER METHODS OF TREE TYING-WILL NOT CAUSE ANY DAMAGE TO THE TREE WHAT SO EVER.